Steve Browne, Professor of Recording Technology at Cedar Valley College, pictured with the college’s arsenal of Focusrite RedNet tools. Photo courtesy of Steve Browne/Cedar Valley College. © 2015. Steve Browne, Professor of Recording Technology at Cedar Valley College, pictured in the college’s recording and mixing studio, featuring an arsenal of Focusrite RedNet interfaces. Photo courtesy of Steve Browne/Cedar Valley College. © 2015. Cedar Valley College’s recording and mixing studio, featuring an arsenal of Focusrite RedNet interfaces. Photo courtesy of Steve Browne/Cedar Valley College. © 2015. Los Angeles, California, April 22, 2015 – Cedar Valley College, part of the Dallas County Community College District, in Lancaster, Texas, is not only a highly regarded institution of higher learning, but it’s also a locus of community activity. The school’s Performance Hall provides quality theatrical entertainment, education and cultural enrichment for both the college and the wider community it serves. The school also has a four-semester audio production program, where students learn music production in a state-of-the-art recording studio working with leading product platforms including an SSL AWS 900 digital console and Avid Pro Tools|HD. Now, the performances that the theater hosts can be recorded and mixed in real time in the studio thanks to the installation of Focusrite RedNet components serving an extensive Dante™ audio networking infrastructure. Three RedNet 4 remote-controlled Focusrite mic preamps and one RedNet 5 Pro Tools|HD interface help provide a solid digital connection between the theater and the studio, creating a synergy that enhances the usefulness of both spaces. That, says Steve Browne, Professor of Recording Technology at Cedar Valley College, greatly expands how students can learn audio production, as well as giving students the opportunity to work on the same networking platform that is becoming an industry standard. “With the growing adoption of Dante networking and RedNet components in facilities all over, familiarity with the gear will give them an advantage in the competitive job market,” he says. And it’s how RedNet enhances the interaction between studio and theater that most excites Browne. “We were investigating ways to be able to record our weekly live recital series here at Cedar Valley College in a multitrack format, and I wanted to do more than just hook up a laptop next to the live console in the Performance Hall without having to run all that copper overhead and mess with all those headaches,” he explains. “So I looked at several options, and the Focusrite RedNet system quickly became the standout. Ultimately, we ended up with three RedNet 4 Mic Preamp units being fed from an analog splitter off the main stage snake. They in turn feed a RedNet 5 in our Studio A Pro Tools|HD room, which shows up in the I/O as two more 192’s. We elected to run a dedicated Ethernet line between the two rooms, and now we have a perfect setup, and coupled with a laptop, we now also have a 24-track remote recording rig that we can take anywhere to do multitrack recordings. This adds another dimension to what students can learn here, which, of course, is the end goal.” Browne also lauded the support he’s received from Focusrite’s customer service reps and from Audio DAWg, noting how that reinforced what he says was a great decision to go with RedNet. 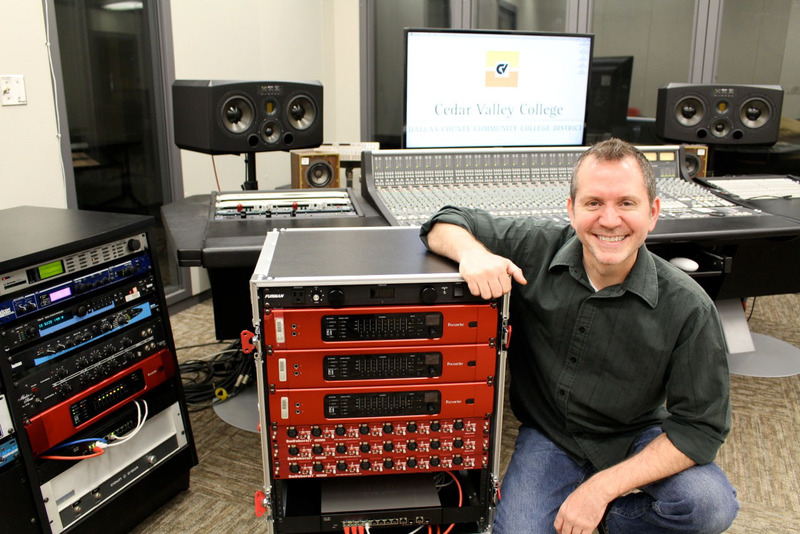 Photo Caption 1: Steve Browne, Professor of Recording Technology at Cedar Valley College, pictured with the college’s arsenal of Focusrite RedNet tools. Photo courtesy of Steve Browne/Cedar Valley College. © 2015. Photo Caption 1: Steve Browne, Professor of Recording Technology at Cedar Valley College, pictured in the college’s recording and mixing studio, featuring an arsenal of Focusrite RedNet interfaces. Photo courtesy of Steve Browne/Cedar Valley College. © 2015. Photo Caption 3: Cedar Valley College’s recording and mixing studio, featuring an arsenal of Focusrite RedNet interfaces. Photo courtesy of Steve Browne/Cedar Valley College. © 2015.